The Northern Ireland team celebrates at Windsor Park following the win against Greece that secured EURO 2016 qualification. Pic by PressEye Ltd.
A proposal to invite both the Northern Ireland and Republic’s football teams to a civic reception in Belfast has moved a step closer following a council committee meeting on Friday. 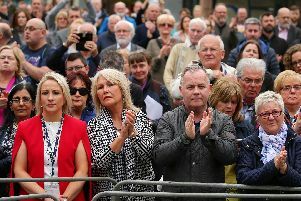 A majority of councillors on the Strategic Policy & Resource Committee backed the amended SDLP motion, which is expected to be ratified at a full council meeting on January 5, despite the objections of the unionist parties. Both the DUP and Ulster Unionists have said it would be appropriate to invite all of the Euro 2016 qualifiers from the British Isles, as both England and Wales are also making their way to France in June. When the original motion - for a civic dinner - was proposed by the SDLP’s Declan Boyle last month, he said it was “a genuine and long-overdue attempt at inclusiveness and reconciliation”. However, unionists have dismissed the gesture as promoting an “all-Ireland exercise” which is bringing politics into sport. Ulster Unionist councillor Jim Rodgers sits on the committee. He said it was likely that the amended plan - an Alliance proposal for a much less expensive civic reception only - would be approved by a combination of Sinn Fein, SDLP and Alliance votes at the full council meeting, but questioned whether the respective football associations would accept the offer due to their busy schedules. DUP councillor Brian Kingston also opposed the motion. He said: “I tabled a more realistic proposal that the Lord Mayor should write to the national football associations for all four countries which have qualified from the British Isles expressing our congratulations and best wishes to them for the Euro 2016 finals.